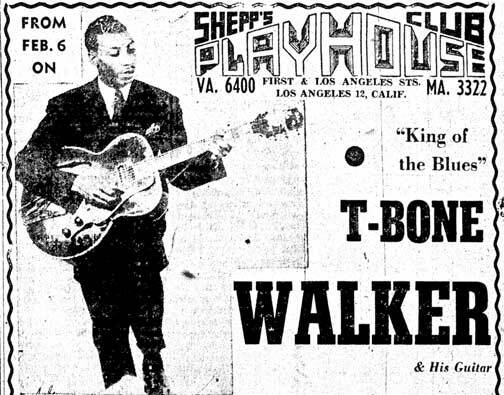 Bronzeville in downtown Los Angeles existed for about three short years in the 1940s. The area known as Little Tokyo transformed into the African American enclave of Bronzeville during World War II after Japanese Americans were evicted from their West Coast homes and placed into United States confinement camps. Then Los Angeles Mayor Fletcher Bowron strongly advocated the removal of Japanese Americans from the Southland, following the Dec. 7, 1941 bombing of Pearl Harbor by the Japanese. By the spring of 1942, Japantowns up and down the West Coast became ghost towns after the United States government issued Executive Order 9066, setting into motion the eviction and incarceration of West Coast people of Japanese descent. Since many of the Little Tokyo buildings were owned by non-Japanese, the owners held meetings in the spring and summer of 1942 to discuss the future of the vacant buildings. One suggestion was to turn Little Tokyo into a Latin American section. As World War II progressed, Los Angeles faced a labor shortage in the war industries, and a huge migration of African Americans, mainly from the Deep South, started to flood the Southland to seek employment. Thousands ended up in the vacant Little Tokyo buildings because most of Los Angeles had restrictive housing covenants that barred people of color from living in white neighborhoods. By the spring of 1943, overcrowding in Little Tokyo gave rise to slum conditions. For about two weeks in early June 1943, white U.S. servicemen, rampaged through Los Angeles in what is referred to as the "Zoot Suit" riots . The violence spread into the Little Tokyo and Central Avenue areas, where African Americans were also victimized. 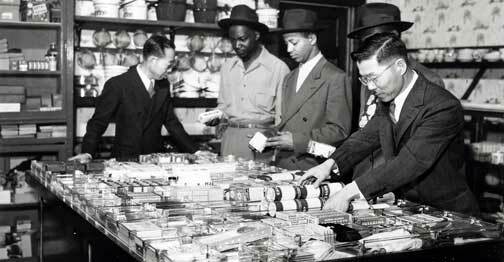 By October 1943, African American businessmen formed the Bronzeville Chamber of Commerce and declared that the area was no longer Little Tokyo. Bronzeville and nearby Central Avenue had an active night life. War workers, flushed with disposable income, patronized various night clubs, called "breakfast clubs", so called because they stayed open all night until breakfast time. Among the best known Bronzeville breakfast club was Shepp’s Playhouse. The incoming African Americans faced a major housing shortage, since an estimated 85 percent of Los Angeles had restrictive housing covenants. 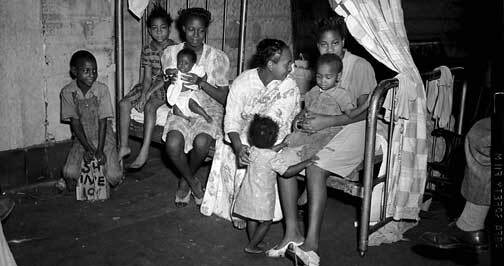 As the housing situation worsened, the Federal Housing Authority proposed in late 1943 to build temporary war housing for African Americans in the white neighborhood of Willowbrook . which was next to Watts and the then-white neighborhood of Compton. The Willowbrook residents protested, claiming a race war would ensue. Infectious diseases, particularly tuberculosis and venereal diseases, spread in the overcrowded Bronzeville/Little Tokyo area. The Los Angeles City Health Department and various community organizations rallied together to try to alleviate the situation by providing health services . Pilgrim House , housed at the current Union Center for the Arts, was formed to provide social service assistance to the Bronzeville/Little Tokyo residents. 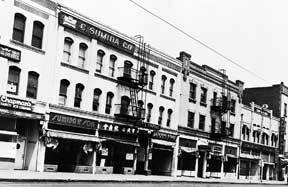 African Americans occupying vacant Little Tokyo buildings was not unique to Los Angeles. Similar patterns developed in other Japantowns up and down the West Coast, since racial discrimination limited African American housing options wherever they went. Reports of African Americans living in Bronzeville/Little Tokyo reached Japanese Americans camp inmates through camp newspapers or the Pacific Citizen, the newspaper for the Japanese American Citizens League. During the transition, as Japanese Americans returned to Bronzeville/Little Tokyo in 1945, African Americans left the area, either because they were bought out or their leases were not renewed or in some cases, sued . While a measure of racial tensions existed, organizations like the Nisei Progressives attempted to assist the African Americans find housing. By 1950, Little Tokyo had some semblance of its pre-war period. However, African Americans did not disappear from Little Tokyo all together. Many continued to live in establishments such as the Alan Hotel, which later got torn down along with other hotels in the 1970s to make way for Parker Center. The longest running business from the Bronzeville era was that of the late Mr. James Hodge, who had opened a newspaper stand on the corner of First and San Pedro streets in 1942. His business endured well into the 1980s where he could be seen selling everything from the Los Angeles Times to the Kashu Mainichi and the Rafu Shimpo. In the book, "Little Tokyo: One Hundred Years in Pictures," Hodge described the Bronzeville period as follows: "This neighborhood here was nightclubs and gambling and prostitutes and pimps. But they weren’t like today. They were civilized. The sun never went down in this neighborhood. Guys were spending money with both hands. It was real exciting…but it only lasted about three years." Anyone with more information on this long-forgotten history, please contact Martha Nakagawa .